(CNN) -- Iran likely has enough material to make a nuclear weapon, Joint Chiefs of Staff Chairman Adm. Mike Mullen told CNN's John King on Sunday. 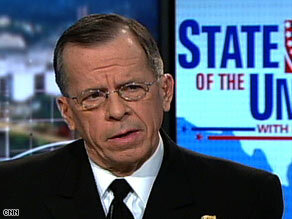 Adm. Mike Mullen discusses Iran and Afghanistan on CNN's "State of the Union" on Sunday. "We think they do, quite frankly," Mullen said on "State of the Union," when asked whether Iran "might now have enough fissile material to make a bomb." "Iran having a nuclear weapon, I believe, for a long time, is a very, very bad outcome for the region and for the world," Mullen added. A spokesman for Mullen later emphasized that Mullen was referring to "low-grade" material, and that to be used for a weapon, it would have to be highly enriched. Defense Secretary Robert Gates, speaking Sunday on NBC's "Meet the Press," said of Iran, "They're not close to a stockpile, they're not close to a weapon at this point and so there is some time." Last week, Director of National Intelligence Dennis Blair told the House Intelligence Committee, "We continue to assess Iran probably has imported at least some weapons-usable fissile material but still judge it has not obtained enough for a nuclear weapon." Tehran has denied pursuing nuclear weapons and insists the country's nuclear program is for peaceful purposes. Last month, a Washington think tank, the Institute for Science and International Security, released a report examining the latest data from the International Atomic Energy Agency, the U.N. nuclear watchdog agency. The institute concluded that Iran has reached "nuclear weapons breakout capability." However, an IAEA official who asked not to be named cautioned against drawing such dramatic conclusions from the data, saying Iran's stock of low-enriched uranium would have to be turned into highly enriched uranium to qualify as weapons-grade material. That hasn't been done, the official said. Capt. John Kirby, Mullen's spokesman, told CNN Sunday, "There are two components here: having enough and having it highly enriched." "The chairman concurs Iran has enough low-enriched to produce a nuclear weapon, but it's important to note it's low-grade, and to enrich it would take time," Kirby said. Blair testified before the Senate Intelligence Committee on February 12, before the latest report from the IAEA and the ISIS analysis. He repeated that testimony on Wednesday for the House committee. "We cannot rule out that Iran has acquired from abroad or will acquire in the future a nuclear weapon or enough fissile material for a weapon," Blair said. "Barring such acquisitions, if Iran wants to have nuclear weapons, it would need to produce sufficient amounts of fissile material indigenously. We judge it has not yet done so." Iran tested its first nuclear power plant on Wednesday. In the test at the Bushehr nuclear power plant, "dummy" fuel rods were used, so no nuclear reaction began. Iranian officials said the next test will use enriched uranium, but it's not clear when the test will be held or when the facility will be fully operational. On Thursday, Susan Rice, U.S. ambassador to the United Nations, told the U.N. Security Council that the United States "will seek to end Iran's ambition to acquire an illicit nuclear capability and its support for terrorism." Iran's U.N. ambassador, Mohammad Khazaee, responded to Rice's remarks with a letter to the Security Council chairman, saying he rejected "the same tired, unwarranted and groundless allegations that used to be unjustifiably and futilely repeated by the previous U.S. administration." Earlier in February, President Obama said the United States is looking for opportunities for "face to face" dialogue with Iran, even though he has "deep concerns" about Tehran's actions. Iranian President Mahmoud Ahmadinejad responded by saying that his country welcomes talks with the United States "in a fair atmosphere with mutual respect." During his tenure, President George W. Bush refused to meet with Iran's president or engage in diplomatic dialogue with him. Bush labeled Iran a member of the "axis of evil" after the September 11, 2001, attacks. Meanwhile, Mullen suggested Sunday that he disagrees with Afghan President Hamid Karzai's decision to move up the country's elections and questioned whether Karzai has the authority to do so. "The elections were scheduled for August and that was a date that was set by the international elections commission and they are, as I understand it ... the final authority in this," Mullen told King. The comments came a day after Karzai decreed the presidential and provincial elections should take place in April, instead of the August date determined by the Independent Election Commission. Karzai, whose term ends in late May, said the constitution requires an election at least 30 days before the end of the term. But opposition groups are crying foul. Karzai has said he intends to run for a second term. But Mullen said the earlier date hampers his efforts to ensure the elections are secure. "I'm on a timeline to get security forces there to provide the kind of security for the elections," he said. "So moving those dates to the left certainly generates a higher level of risk with respect to security for those elections, which we want to be free and fair as well as secure."